“We believe that you can take the BOY out of BOMBAI(Y), but you cannot take BOMBAI(Y) out of the BOY… “. This holds true for us (founders of this Cafe Mrs. Sakshi & Dr. Indraneel Adkar). We moved out of Bombai (Mumbai -The city as its now known) but could not get the Bombai(y) (our emotion/feeling) out of us. Our love for Bombai(y) and its food has led to the creation of Bwyta Bwyd Bombai (3B’s). Bwyta Bwyd Bombai (3B’s) – which simply means Eating Bombai(y) food, thrives to bring the best of Bombai(y) Street food to Cardiff . Authentic and delicious street snacks and mini meals brought to you for a taste experience of its kind. 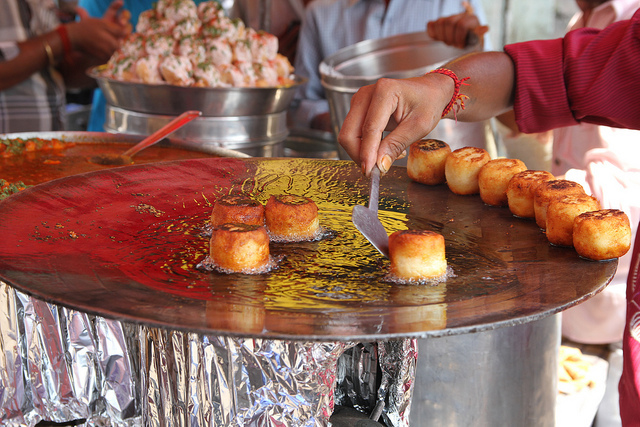 A very interesting fact about street food is that it entices most of your senses i.e the sense of touch, smell, sight and taste. We too give you an opportunity to entice your senses and encourage you to eat your meals without the aid of cutlery. At 3B’s, we would like to tantalize your taste buds with some exceptional street food, which is stylish but casual! We have maintained a menu based on home recipes with an understanding of fine-tuning tastes of the 21st century. Our food aims to comfort as well as inspire and satisfy the demanding palate of our diners. We are very vigilant and obsessed of our ingredients ( spices) knowing that true flavor needs to start from the genuine good quality raw material. Our Meals are quick and they will satiate your hunger at anytime of the day. NO RESERVATIONS REQUIRED to experience the taste of Bombay food. So come indulge your self our Style.. Bindaass (without any inhibition)!!! any time and we’ll be happy to serve you!